The Batiri is 508.5 KB. Larger files take longer to load. 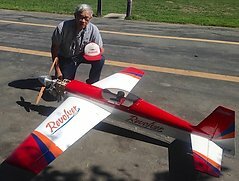 Batiri is J. Manuel Tellez' 1/2A free flight competition model, spanning 32 inches. The airframe sports surprisingly modern design although dating from the early 50s: the lightweight wing features geodetic wing rib layouts for lightness, strength, and rigidity, and the fuselage is a lightweight stringer construction. If you need to resize a plan please contact us with the ID:97751 and the desired wingspan. I will calculate a price upon request, please contact me here mentioning this PlanID: 97751 and the job you wish me to do.